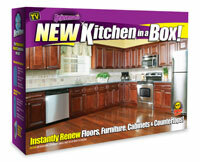 We are pleased to present information on New Kitchen in a Box, as shown and provided by the company offering it. Because we have not tested this product, we are unable to endorse it or provide you with any additional information. Instantly renew cabinets, countertops, floors, and furniture! For Life Products announced New Kitchen in a Box, a do-it-yourself renovation product that instantly and inexpensively ($19.99) brings a kitchen back to life. The new kit easily transforms an old kitchen to new by just applying the products directly to old and dull cabinets, countertops, and floors. Not only does New Kitchen in a Box refresh a tired kitchen, it also protects from the damaging effects of UV rays that can discolor floors and fade cabinets. Rejuvenate Floor Restorer restores floor shine and luster. Countertop Scratch Remover and Countertop Polish & Sealer when used regularly, remove fine scratches and rid surfaces of a dull appearance, ideal for synthetic countertops, cultured marble, and laminate countertops. Rejuvenate Cabinet & Furniture Renewer seals and protects kitchen cabinets while it brings back long-lasting shine.